This week has been insane. It feels like each day I've barely had time to breathe. Yesterday alone I was in class; I ate a quick lunch; had a rehearsal, then choir; taught a voice lesson; went to another class, then a masterclass. I had a few moments to eat dinner, in which I simultaneously ate and studied my music. Then I went back to the School of Music to watch an (excellent) recital given by some guest artists. I got home at 9:50 and promptly fell into bed. You couldn't get me into that bed fast enough. The rest of this week has been similarly crazy. It's like a lot of noise, raging up around me. Wednesday I even skipped my first class, and the day was still entirely weird and far too busy. That day, my youngest brother, the one who still lives at home, called me around 5:30 pm to tell me he had locked his keys out of his car -- the day my mom left her cellphone at home. Obviously, the hustle and bustle of everyday life is felt by all of us, so much so that the noise drowns out all reason and sanity and we do silly things, like leave our phones at home (Mom). A question I've been asking myself recently is this: How do we remember who we are, who we've been made to be, in the middle of the loudness? How do we experience adventure here? When the entire world is raging around you, and seems unlikely to stop soon, how do we remember that we are still people -- people with souls and longings and dreams? 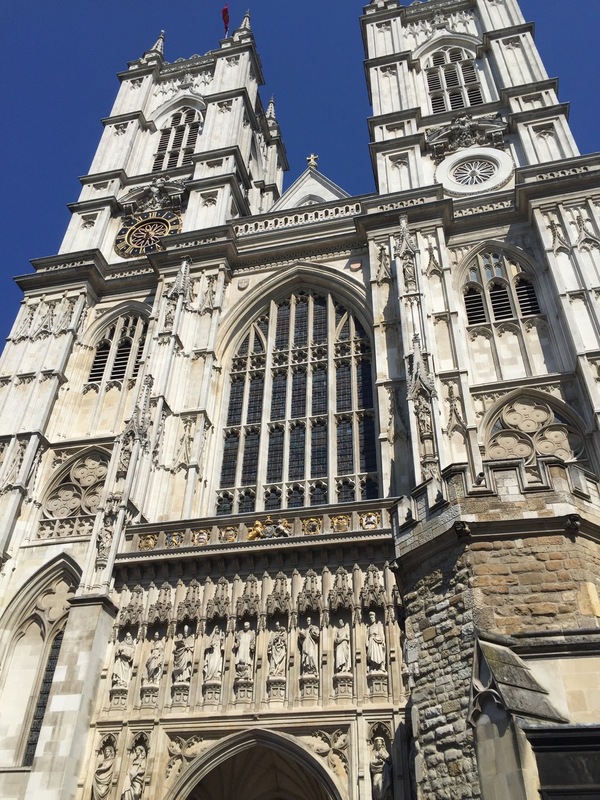 The featured image on this blog post is of Westminster Abbey, one of the most quiet places I've ever been, despite the throngs of tourists within it. Church is a sanctuary. It's a place to get quiet. Sanctuary is where we can just sit and be who we are, where we can meet with God, where we can actually hear ourselves think, as opposed to the day-to-day loudness. I think if we're honest with ourselves, we're all craving this silence, even if just for a moment. It's why I have to go off-campus and be alone during my dinner breaks. How do we find sanctuary in the midst of the crazy? My answer: I don't know. That is, I don't know a response that works across the board. But I can tell you what's been working for me this week. All of these have been gifts from God that came my way. A healing conversation with a dear friend who saw me where I was and pointed it out to me. Long conversations after hours with really awesome people. People who look me in the eyes and see my heart there. Discussions about artistic freedom and expression in my Vocal Pedagogy class. Really, really excellent masterclasses that address everything I've been working on in my own voice. Laughing at my mom and brother (the one who locked his keys in his car). Discovering, slowly but surely, my vocal identity. If you can see, many of these things involved people. I think that's noteworthy. Being in community heals us. And I mean real community, y'all: people who see you for who you are, see where you are, and love you in the middle of it. There have been several wonderful women this week who looked me in the face, saw me where I was, and loved me in the middle of it. One of them has made it known through her words that she sees me, not my front, and I am still praising God for her. Another has simply hugged me and held me. I am so grateful for everyone who has healed me this week, whether they knew it or not. They have been a quiet place for me to be who I am. And from this quiet place of rest in my soul, I can move out into the loud, boisterous world as myself. I can walk into the insanity with my soul bared. Yes, it may feel like a battlefield, or like I'm going to be trampled. But more often than not, I've found that when we allow ourselves to meet the crazy world as we are, without fighting it, we meet even more quiet places. More people who meet us where we are, and, to our surprise, actually love us. May we (including me!) move into the world today with our souls bared, with peace in Jesus and unafraid of the noise. May we not cover our ears to block it out, but instead, breathe deeply in its midst and know that it won't be like this forever, even if it feels like it. May we be quietly brave in the midst of this battlefield. May we look up and see others around us, and see the sky and know that because of Christ, we are not alone.